The trip begins with your arrival in the Gorakhpur To Kathamndu. You are escorted to the hotel, where you complete your check In procedure and rest. The essence of the ancient, along with the modern day influence can be observed in the lifestyle and the buildings in the city. Kathmandu is the center for religion, culture and politics of the whole of Nepal. Once you reach the hotel, you can spend the rest of the day at leisure in the comfort of the hotel. After breakfast, you set out for the city tour. Firstly, you visit the sacred Pashupatinath Temple, along the banks of Baghmati river. The temple is in dedication to Lord Shiva, it is the epitome of the Hindu religion in Nepal. Your second destination will be the holy Stupa of Bouddhanath, this is believed to be the oldest and the largest Buddhist structure in the country. Further, you visit the famous city, Patan/ Lalitpur is known for its rich cultural heritage. It is covered with great ancient architectural structures. The well known Kathmandu Darbar Square is another attraction, it has a huge statue of Lord Hanuman and other temples within the complex. Patan is home to the Refugees from Tibet, who makes the area brighter with their handicraft stores on the outskirts of Patan. 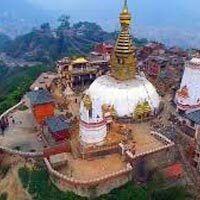 The sightseeing drive ends with your visitation to the magnificent Swayambhunath Stupa, located on top of a hill. All the four sides of the Stupa are painted with eyes of Buddha, which seems like it watches over the city. The busy day comes to an end with your return to the hotel for an overnight stay. After a hearty breakfast, head towards Chitwan. The National Park in Chitwan is the first one in the country and is listed as a UNESCO World Heritage Site. It has a variety of wild animals and plants. You can spot out some rare and endangered animals like one horned Rhinos, Bengal tiger, crocodiles and many exotic birds. In the park, you can experience an elephant ride, wildlife safari, nature walks and more. The National Park experience is very thrilling, just walking around the lush green forest areas and coming across the locals give you a great opportunity to know about the culture and lifestyle of the people there. In the evening, you return back to the hotel for dinner and a night stay. After breakfast, you drive to the scenic place of Pokhara. The way to Pokhara is filled with greenery, rivers and tranquility. On reaching Pokhara, you check in at the hotel and rest for some time. Later in the afternoon, you set out for local sightseeing , first you visit the Binsabasini Temple dedicated to goddess Durga. You then leave for Devi’s fall, it is beautifully placed and opposite to the lake is a cave, Gupteshar and is considered sacred.This cave consists of natural forms of deities. After exploring much of exotic Pokhara, you return to the hotel and retire for the night. After breakfast, you drive back to Kathmandu and soon head towards Nagarkot. The main feature of Nagarkot is that it provides a panoramic view of the Mt Everest, rising and setting of the Sun. On reaching Nagarkot, you check in at the hotel and rest for a while. Later, you leave for sightseeing. In the evening you return to the hotel for an overnight stay.